Notes: Also known as North German or Opsal Cemetery. In 1866, a small frame church was built along the Black Earth road, now Highway 78 N. about a mile north of the Corners. It served a closely knit number of German immigrants who were not Lutheran or Catholic. Gradually the community changed. The small congregation dwindled and, by early 1900s, the church was not used. A grass fire in 1926 got out of the caretaker’s control and the structure burned to the ground. 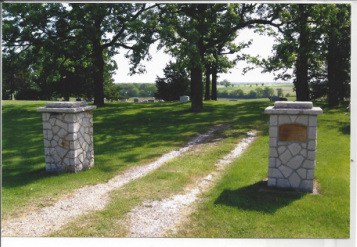 The adjoining cemetery called “North,” was part of the original agreement. When the plat of land was donated, there was this provision: “That it never be used to sell liquor or as a place of public amusement” It is maintained today by decedents of the early group of worshippers, and in recent years there have been burials there.